Apple's unveiling of the iPhone 6S, iPhone 6S Plus, Apple TV, and iPad Pro dominated the news today, but at the end of their special September 9th event, they quietly released the final version of iOS 9 to developers, called the Gold Master (GM) build. The public version doesn't come out until September 16th, but you can actually install the iOS 9 GM build on your own iOS device without having to be in the Developer Program. We've rounded up all of the leaks for you below, including links (courtesy of iTrackr.fr) that are specific to your iOS device. You can't downgrade from iOS 9 back to iOS 8, so if you upgrade, there's no going back. We can't vouch for any downloads you make from other websites, so be cautious. Now that you know the risks, continue to the downloads below and find the correct file for your iOS device(s). With the correct file downloaded on your computer, make sure to place it somewhere easy to find. Also, before you start, back up your iOS device through iTunes in case anything goes wrong and you need to restore. Using iTunes, you'll now be installing the iOS 9 GM. With your device connected to your computer, hold down on the Option (for Mac) or Shift (for Windows) key, then click on either "Check for Update" or "Restore iPhone...."
Note: "Check for Update" will flash the iOS 9 GM over your existing OS, while "Restore iPhone" will delete your old OS and install the new one. Either one is fine to use, but "Restore iPhone" is preferred and is the least likely to result in bugs and OS issues. 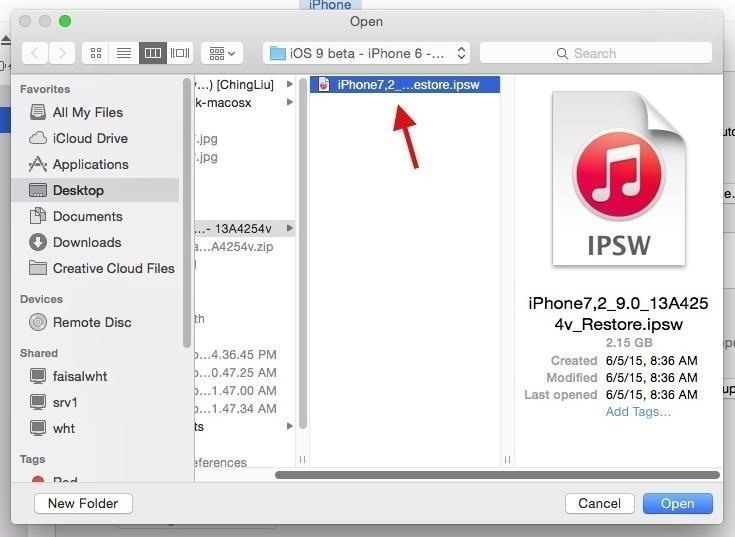 Find the IPSW file you downloaded and click on "Open." iTunes will ask if you want to update to iOS 9—click on "Update" and your device will begin the process of installing iOS 9 GM. With iOS 9 on your iPad, iPhone, or iPod touch, where do you start? You can check out our dedicated page to everything iOS 9 to get acquainted with the new mobile operating system, which features an updated Siri, an improved Notes app, a revamped Music app, Low Power Mode, and more. You can also check out our extensive iOS 9 features guide. The link to iPad Air A1475 Mega is to A1474. Could you please upload a A1475 one?